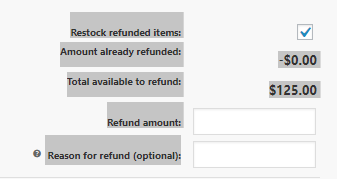 Fill in the amount you wish to refund, can be the total or a specific amount. Refund manually - Only used for records. If you prefer to process the refund with your payment processor, this will then be how you mark this order on the backend 'Refunded' to update the total for your records. Refund Via [Your Payment Processor Here] - This will connect with your processor to update the order, send a notification to the customer and complete the refund. If you are unsure - Check in with your payment processor support team to run the refund with them and then update manually on the site separately.